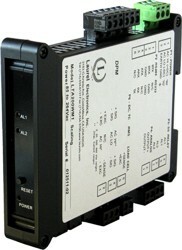 The Laureate 4-20 mA and RS232/RS485 output, process signal input transmitter provides zero and span adjustment for use with a wide range of industrial transducers. Six DC voltage and four DC current input ranges are jumper selectable. The two most sensitive voltage ranges, 200.00 mV and 2.0000V, provide a high input impedance of 1 GΩ to minimize the load on the voltage signal. Fast read rates at up to 50 or 60 conversions per second while integrating the signal over a full power line cycle are ideal for peak or valley capture and for real-time computer interface and control. Digital signal filtering modes are selectable for stable readings in electrically noisy environments. The internal digital readings and analog output can be individually selected to be either unfiltered or filtered. Note: The same DC signal conditioner can be user configured for DC, process, bridge, and potentiometer signals.It is precalibrated in EEPROM for all DC Volt and DC Amp ranges listed for DC transmitters.